Whether looking for recreation or relaxation there is something for you in Homer. Take a ride on the Homer trolley and explore the towns shops and services through the 4 zones we have here. Click on each picture to find local featured business and services from that town zone. Be introduced to the charm and history of ‘Old Town’ in Homer. The original area of settlement that eventually became the start of our town. Nestled between the Homer bypass and Kachemak bay it is filled with great restaurants, spa, and an art gallery. Also, the exhibition building called Islands and Oceans visitor center makes its home just south of the homer bypass and is a fun and excellent way to acquaint yourself with the largest seabird refuge in the world while also learning of local wildlife around Kachemak Bay. The beautiful park Bishop beach and Beluga lake are all in the area and both are a excellent place for bird viewing or just to take a stroll after enjoying some of the food at one of the excellent restaurants. Bishops beach is a park that is miles of beach for you to enjoy along Kachemak Bay while Beluga Slough trail is probably your best chance for bird viewing near Beluga lake which historically has large numbers of birds at certain times of year. Do you love art? Then it is a must to come to this area. Located in Homers largest historic building is Bunnell Street Arts Center. You will enjoy unique and interesting art exhibitions. And to the north of the bypass (Sterling Highway) is a myriad of banks, post office, and grocery stores for all your daily needs. Welcome to the heart of Homer. From the beginning of Pioneer Avenue to the turn off at Lake Street there is a whole host of shops, museum and restaurants there to pique your interest. The award-winning Pratt museum is an excellent way to spend a few hours learning of Homer through exhibits of natural history, Native cultures, art, homesteading, quilts, fishing, and marine ecology with a live aquarium. Several unique shops in the area will give you the chance to find a once in a lifetime gift for yourself or someone you care about. Anything from outdoor wear and gear made locally, unique whimsical home décor shops, a pottery co-op hosting numerous artists, a emporium with a multitude of various artisans and vendors, to art galleries showcasing multiple mediums of art you will have no trouble finding that special gift. Local coffee roasters also make for great pit stops between shops and when you are finally done shopping there are various restaurants and bars to finish the day in. 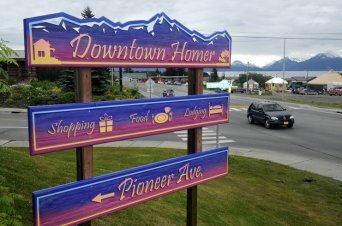 Every Saturday and Wednesday this part of town is filled with people looking to buy local produce and products from the Homer area. They are all headed to the amazing Homer Farmers market. In the market you can buy anything from a peony flower when in season, to delicious produce, jams, to woodworking wares, freshly made donuts and really so much more that could be listed here. It’s a great way to ‘taste’ Homer! After the market or on days when it is not open head to one of the two local microbreweries and enjoy a drink or two with local fresh oysters as you plan your next adventure. For those looking to catch a flight the airport is also located near this area. Though maybe not as abundant in shops as other areas what they lack in quantity they make up for in quality. Unique shops where you can find bicycles and chainsaws in the same shop to a shop dedicated to being responsible to the environment with the selling of its wares. So come and check out the farmers market and stay around for so much more. The famous Homer Spit. The end of the road. A place of adventure and fun, it’s really a place where great memories are made for a lifetime. Are you looking to fish and catch the ‘one’? Numerous charter offices on the spit offer you the amazing adventure of fishing for a prized halibut, salmon, cod, or even rock fish. Do you want to kayak or go on a bicycle ride? Rent one on the spit and enjoy the local nature around you as you paddle through the bay or bike through the local terrain and trails. How about taking a water taxi across the bay and go hiking for the day in remote wilderness at Kachemak Bay State park? Or see a once in a lifetime view of a bear up close by booking a plane to take you where they habituate in the summer. Or maybe just relax with a coffee or baked good in between exploring the different souvenir shops. Food, especially fresh seafood, is abundant on the Spit. The choices feel almost endless. Anywhere from fine dining to fish and chips you will find what you want. The Homer Spit is a must visit for those coming to Homer on vacation.